Kansas quarterback Carter Stanley (9) look to cut around the Ohio defense during the second quarter on Saturday, Sept. 16, 2017 at Peden Stadium in Athens, Ohio. 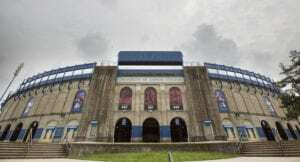 Athens, Ohio — As so often has been the case during his two-plus seasons on the job, Kansas football coach David Beaty left a loss with more problems than solutions Saturday. 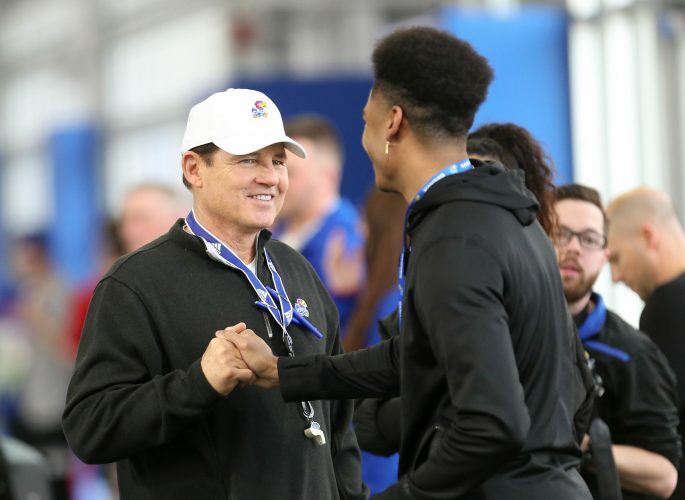 Still, a potential fix for some of the Jayhawks’ woes up front might have been discovered with a change to the lineup. Sophomore offensive lineman Andru Tovi made the first start of his KU career in a 42-30 loss at Ohio. And though sophomore Antione Frazier started his third consecutive game at right tackle, he soon gave way to graduate transfer Zach Hannon. While Beaty admitted he will have to watch the game footage to tell for sure, he didn’t recall Tovi giving up much as the left guard, working in between regular starters Hakeem Adeniji and Mesa Ribordy on the line. “He played a bunch of snaps today, too, which I was worried about him toward the end, but he kept going,” Beaty said. Hannon, a 6-4, 315-pound Kansas City, Mo., native who graduated from Nebraska earlier this year, made KU better up front, too, according to Beaty. Although junior quarterback Peyton Bender suffered five sacks at the hands of Ohio (2-1), he admitted he held the ball too long on most of those instances. 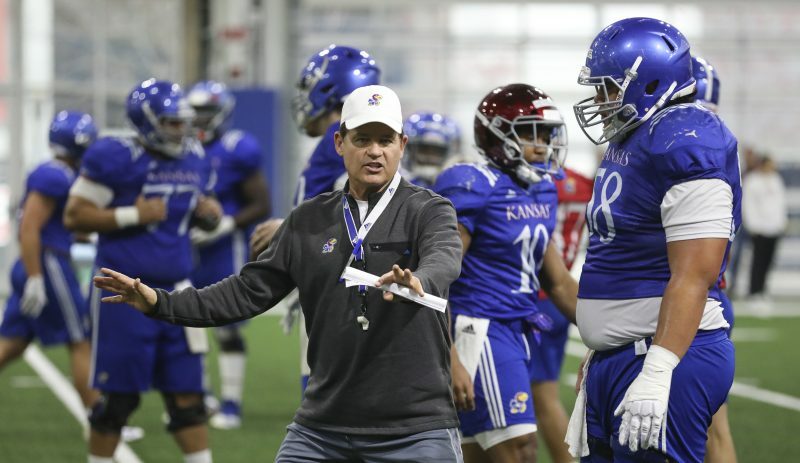 Bender said Tovi and Hannon brought some stability to the Jayhawks’ O-line. After sophomore Khalil Herbert rushed for a career-best 137 yards and his first two touchdowns of the season, the running back explained why he felt confident in his big blockers. 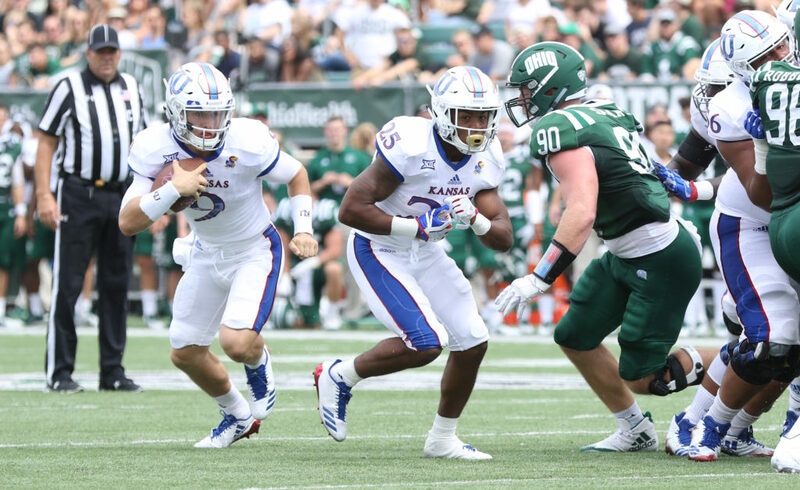 True freshman running back Dom Williams and junior linebacker-turned-fullback Hudson Hall joined Tovi as first-time KU starters against Ohio. Williams, who a week earlier versus Central Michigan led KU’s ground attack, didn’t feature as much into the plans after a slow start. Backup Kansas quarterback Carter Stanley checked into a game for the first time this fall. The redshirt sophomore who entered the season with a hand injury relieved Bender briefly in short-yardage situations. Stanley did not attempt a pass but handed the ball off to Herbert on one option-read and converted a fourth-and-one as a rusher on another. Down 25-14 at intermission, KU attempted an onside kick to open the third quarter. Ohio, though, benefited when freshman Liam Jones’ kick was downed after traveling only eight yards. 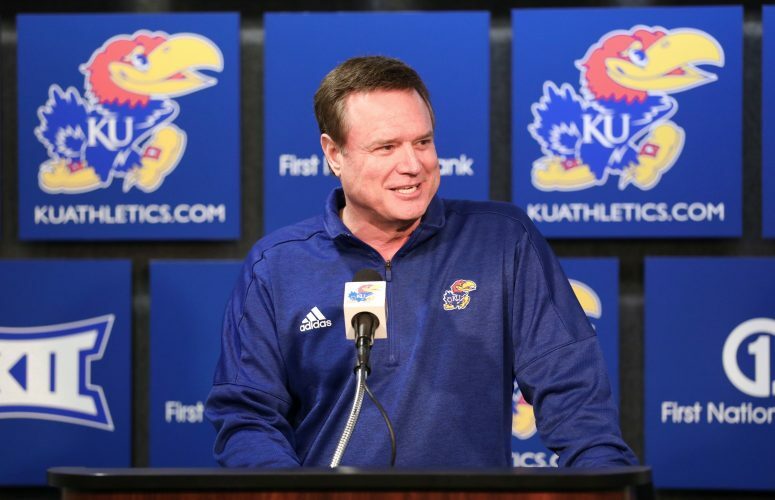 The third-year KU coach said the hope was to shift the momentum out of the third-quarter gates. Both junior running back Taylor Martin and senior defensive tackle Isi Holani missed the road loss due to unspecified injuries. Junior receiver Jeremiah Booker caught his first career touchdown, on a one-yard throw from Bender in the fourth quarter. … Junior defensive tackle J.J. Holmes made the first sack of his KU career. 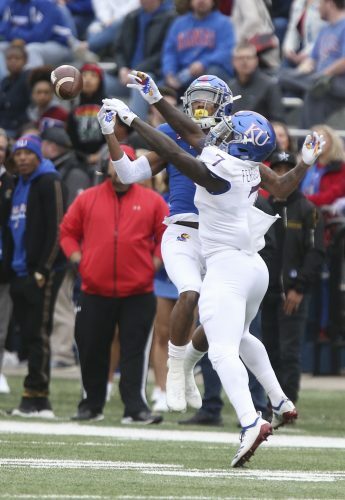 … Sophomore safety Mike Lee recorded his second interception as a Jayhawk. … Junior linebacker Joe Dineen again led KU in tackles, with 11 total. The Free State High graduate has three straight outings with double-digit stops. … Junior defensive end Dorance Armstrong Jr. made two tackles for loss and a season-best nine total tackles.